A Gaur "toddler" looks curiously at us while his younger cousin, who is perhaps oblivious to humans, keeps his mother busy. The ground was wet from the previous evening’s rain, and the grass tall and green. The sound of tyres churning small sandstones as we traversed inside the park was the only man-made sound amidst the clamour of birds and crickets.A pair of a cow Gaur and her suckling greeted us at the Owrai meadows – the cow regurgitating the tender grass, and the calf feeding on her milk – both their tails swayed uniformly like pendulums, keeping flies at bay. They stood here for well over 20 minutes until the calf decided to join his elder and younger cousins in the herd. 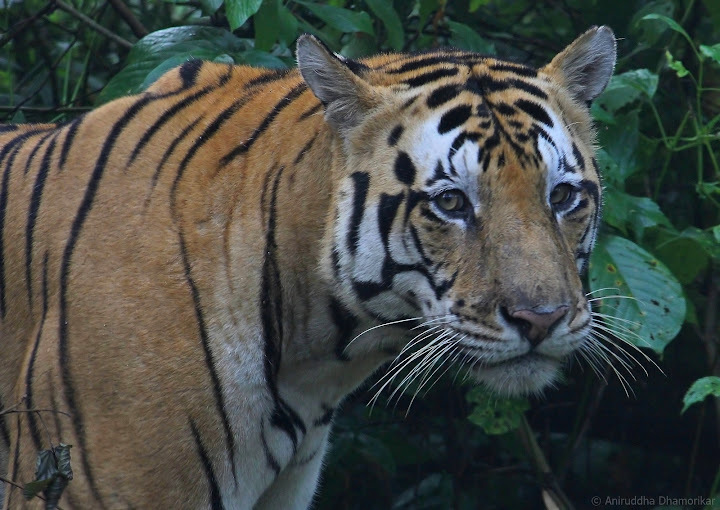 As they moved out into the Owrai meadows, the alpha emerged from the lee side of the road where he was busy stripping barks from trees, and once they were all off the track, we moved on underneath an arch of Sal forest. Sunlight creeps in from the minarets of Sal trees on a cold hazy blue October morning. The forest always seems to lull me to sleep whenever I pass through in a vehicle – a habit my friends find irksome – but that sleep, which many of us have experienced but felt too embarrassed to speak about – is the best kind of slumber— short-lived, but ever so refreshing. That slumber is different: you’re more at ease, more relaxed, and with your eyes closed you feel the forest move past you – you hear the trees whispering in your ears, you hear them rustle, sigh and sway, you hear the chirps of birds, the chirrups of insects, and when you pass over a small stream you hear it murmur and you smell its sweet earthly scent, and when you pass through the meadows you feel the crisp breeze and hear a subtle squall. It is only my eyes that remain shut, I tell them. The dreamy paths took us through glen and glade, and skeleton trees, and those adorned in heart-shaped leaves, and those sprinkled with dew. They swept past us like distant but warm-hearted strangers, stronger and wiser than you and I. Then down a narrow bridge built over a small stream we met someone who had a hint of the movement of the famed cat of Kanha. We decided to wait. The forest girded the path a little too tightly; its bamboo blades caressed us or tried to get close to us whenever they could. Do they miss the human touch, I wondered. These were young grasses full of youth and tenderness – with their culms thinner than toddlers’ arms; they were probably less than half a decade old. A magnificent Bamboo grove in the making; one which perhaps gives the tiger its stripes. When the silence, rather the stillness of anticipation grew too tense, we decided to move. Just as the gypsy raced to climb up the dell, a gentle movement in the young bamboo grove caught our attention, and the sound of footsteps-that-do-not-whisper suddenly led us to a blaze of colour—striped in gold and black with a belly dusted in powder-white, and a face war-painted and calm. 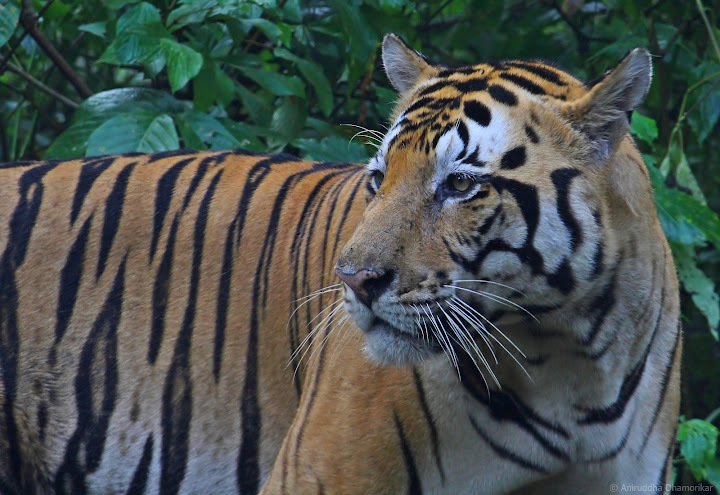 A Bengal Tiger – the supreme predator of Kanha’s wilderness whose shadow enshrines all that live here – emerged from the thickets, and stretched his head to take a sniff of the overhanging bamboo blades. The blaring crackles of langurs and shrieks of birds. The tiger headed towards us as though we were invisible to him. He walked as if nothing stood in front of him and his path: his resolve was that of an emperor, his gait was that of a prince, and his sense of purpose that of a lover. We reversed up the slope now, and a train of gypsies that were behind us moved backwards in unison. His meditative way of identifying the scent perhaps left behind by a tigress. He decided to suddenly sit square just beside the path, and rolled over like a frolicking dog would, and scratched in the ground, sniffed, and started walking again. He did so because he was looking for someone, and left a reply where a previous passerby had left her message: with his scent. mammals grin in a typical fashion to allow the scent to enter their vomeronasal organ. Then he sniffed another blade of an overhanging bamboo frond, grimaced, and exposed his teeth to inhale the subtle traces of the tigress he was looking for. 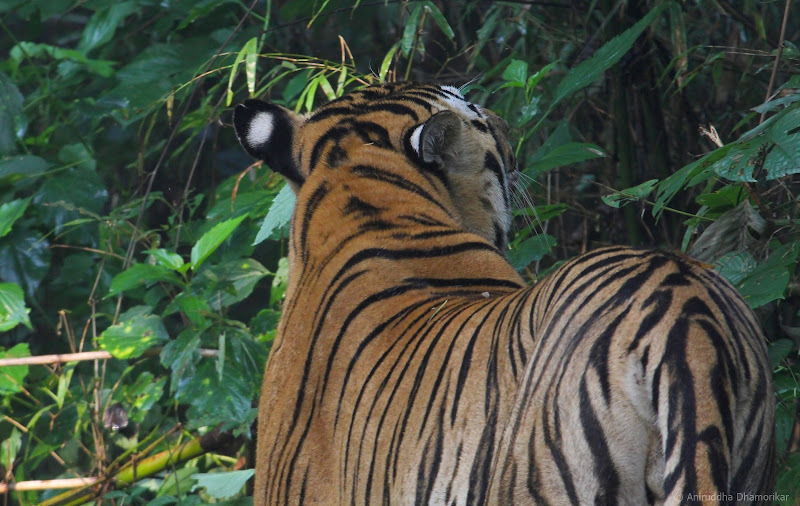 His flehmen reaction was quite bold, and he stood like this for a few seconds dissecting the cues in the scent of the tigress, then turned about, raised his tail, and spurted two sprays of urine that misted in the bamboo thicket. He sits to rub his scent on the edge of the slope. He then resumed his gait for a few yards and decided to sit upon the edge of the slope as we moved further backwards. The early sun shone from behind him, and his colossal muscles embellished his already larger-than-life stature, casting shifting shadows on the golden landscape streaked by dark stripes. Here he sat for a few seconds, rubbing his under parts onto the ground to leave his scent, and then moved ahead. ...and squats to leave some more scent behind where a passing-by tigress left hers. Then he assumed an unlikely posture, one not refined enough for a king – he squatted, and instead of doing his business, he urinated, scratched the ground, sniffed, and moved ahead again. We parked several yards away from the road we thought he’d take, and he walked through our predicted path looking about and sniffing around. And then our eyes met. He looked straight at me; unfortunately my eyes were hidden behind the lens. That was the calmest expression I’ve ever seen on a tiger’s face. This calmness, for me, signified a trust in humanity: a trust in living in harmony, a plea to let him be. It signified an unfinished story that haunts all tigers and humans alike: a malady of human-tiger interaction that always nudges us at the back of our minds, an afterthought of who’s after whom – and why, an aftertaste of the backlash that arises from the attacks, that leaves a bitter taste in our mouths. And in that moment I thought sorrowfully that man will never let the tiger be. An effective way of communicating, "I'm the one you're looking for". The tiger did what a tiger does. Perhaps he was a lover, a seeker, and this meeting taught us a lot about his life in the wilderness – and I saw why a tiger is called the king of the jungle – a portrayal I would be more at ease with than Kipling’s Sher Khan, the man-eater, but deep down inside me I know that a tiger is a species that is struggling to survive, trying to eke out a living in a human-dominated landscape, and taking what he can with him into the forests. This is something different than his larger-than-life portrayal most of us admire him for. And he looked back and forth ever in search of the tiger scent that only he could detect. The interactions between man and tiger were always volatile, and they will remain so forever if we are to refrain from fencing them inside Protected Areas that are meant to be porous. But if a tiger is caged, we defeat nature’s very purpose of intermingling. The tiger will find his mate, but his cubs will be born in a prison. As I looked at this tiger, I was reminded of this terrible future where tigers survive but they’re a product of man’s obsession to tame nature. But on that day, oddly, it seemed as though he was just thanking me for his space. A chance meet that turned into lingering thoughts. 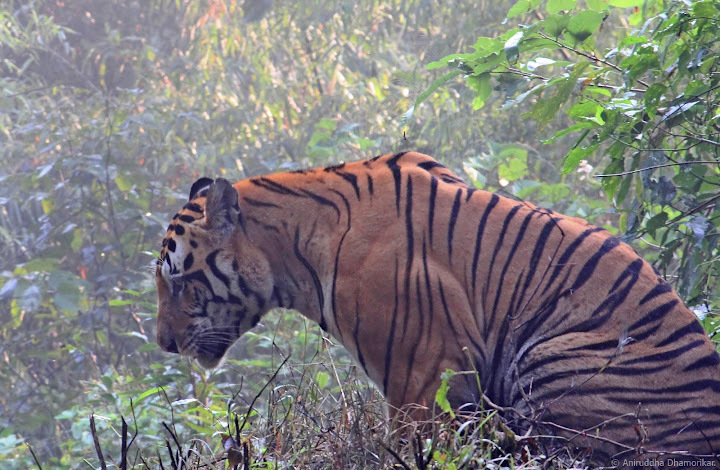 We followed silently as he walked in front of us – doing what a tiger does – and disappeared on a path forbidden for humans, and we saw the golden blaze dissolve into the lemon greens. And I thanked him for his time.